This is a nice, simple little WordPress site that is designed to showcase the client’s services in a well Search Engine Optimised manner. 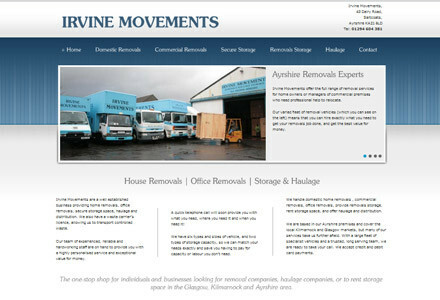 I did the appropriate keyword research, identifying the keywords being used by Google users for the Irvine Movements services. I applied the results of this to the copy, together with similar research done on localisation keywords. The upshot is a tidy 6 page site which has been heavily optimised to deliver on a commercial level. There’s not a huge list of technical points for this job – it’s an example of how a simple little brochure site can be cost-effectively produced and delivered.